Three days definitely makes a trend. Once again today, the market hit its highs early and closed at the lows of the day. For much of the day, there was little consistency between the leaders and laggards, as at some points buying the leaders would have have been better, while at other times the laggards would have held up better. What this market really needs now is a downdraft at the open to flush out the weak hands remaining. Imagine what GDP growth would have been if we didn't have a devastating hurricane during Q3. But it still probably wouldn't have been nearly as strong as India. OECD outlines potential headwinds to global economic growth. Internet sites with the strongest traffic Monday were (in order) eBay, Amazon, Wal-Mart and Overstock. Chicago Fed Report shows broad-based strength across all sectors. The race to win the battle of the living room. Who said there wouldn't be enough content for Video iPods? It didn't take long for brokerage firms to come back to Manhattan. A slowing housing market remains the number one concern heading into 2006. India: Not just for outsourcing call centers anymore. Let's just say Pimco's McCulley is not Greenspan's biggest fan. How to Run a Successful Business by U2. The little blue box? How about the yellow plastic bag. Wal-Mart is the largest retailer of diamonds in the U.S.
Want a six-figure salary? Come to Manhattan. If you thought 2005 was bad for hurricanes, just wait until 2006. Note: For the last two months, the S&P 500 has been down on the first day (-17 bps and -35 bps). The DJIA rose 162.20 points (1.6%) to 10,590.22 after crude oil fell more than $3 a barrel to $45.49. Higher-than-expected factory orders and consumer spending reports boosted retailers and industrials as well. 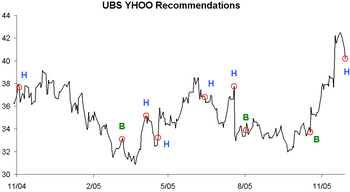 After the close today (11/29), UBS downgraded YHOO from buy to neutral. Of all the analysts covering YHOO, the UBS analyst has the top record on the stock (the analyst also covers AQNT- neutral and GOOG- buy, but does not place in the top five on either of those names). Below is a snapshot of the analyst's calls for YHOO over the last year. Does two days make a trend? For the second straight day the market hit its highs early on and closed at the lows. For much of the day, the losers at any given time held up better for the remainder of the day than the winners, indicating that the investors are quick to take profits. It's amazing how one day can change investor psychology so quickly. Some people are starting to get nervous with Google over $400. First Chile says copper production will be lower, then Freeport says the same. I wouldn’t want to be the trader in China who was short copper. BP throws some weight behind alternative energy. Remember the Emulex press release hoax. Would you ever offer a home-seller the top of the range they were asking? What do you think C-SPAN will cost per month? Gold to $1,000? Nothing like a rally to bring out the bulls. I guess the guy that started 6-minute abs is now giving stock advice. 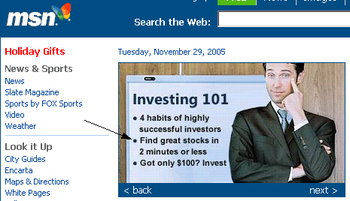 On the front page of MSN.com this morning, one of the headlines reads: Find Great Stocks in 2 Minutes or Less. No wonder the "little guy" can't beat the market when he is subjected to articles like these. 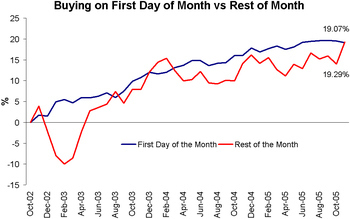 For the fourth month in a row now, existing home sales and new home sales have played games with journalists, as the reports have given opposing views on the housing market each month. Last month when Existing Home Sales were stronger than expected, the newspapers wrote that real estate is still hot, only to be negated the following day by a weaker than expected New Home Sales report. Can't wait to see what the papers will say tomorrow after New Home Sales blew away estimates and made record highs this morning. One common perception about meaningful market rallies is that volume increases, most notably in the more speculative names. The chart below plots the S&P 500 (top) vs. the average 50-day ratio of NASDAQ volume vs. NYSE volume (bottom). 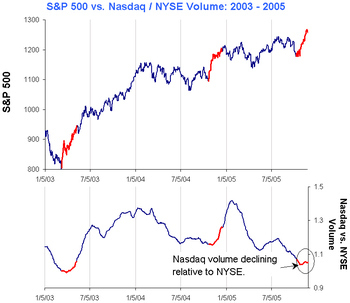 As you can see, during the market's rally off of the March '03 and October '04 lows, volume in NASDAQ stocks increased relative to NYSE volume. During the most recent leg up, however, NASDAQ volume has declined. Some investors have questioned whether this rally is sustainable if NASDAQ volume does not show a meaningful uptick. We think investors may be looking to the wrong area for speculative activity. First, NASDAQ stocks are no longer as speculative as thought to be. In our November issue of Reminiscences we highlighted how volatility levels in the NASDAQ 100 actually turned lower than the S&P 100 earlier this year. Second, the hottest sectors of the market this year (energy and commodities among others) have a greater presence in the NYSE as opposed to the NASDAQ.